This colorful skyscape spans about two full moons across nebula rich starfields along the plane of our Milky Way Galaxy in the royal northern constellation Cepheus. 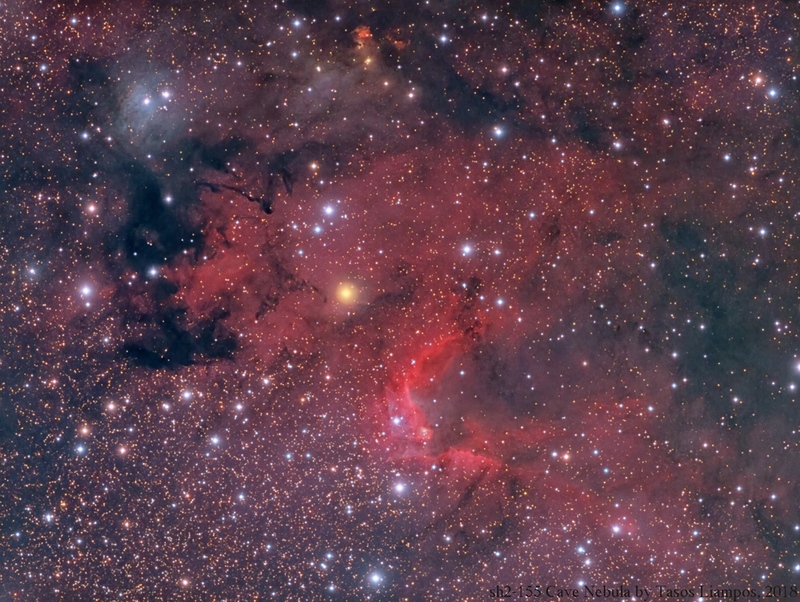 Near the edge of the region’s massive molecular cloud some 2,400 light-years away, bright reddish emission region Sharpless (Sh) 155 is below and right of center, also known as the Cave Nebula. About 10 light-years across the cosmic cave’s bright walls of gas are ionized by ultraviolet light from the hot young stars around it. Dusty blue reflection nebulae, like vdB 155 at upper left, and dense obscuring clouds of dust also abound on the interstellar canvas. Astronomical explorations have revealed other dramatic signs of star formation, including the bright red fleck of Herbig-Haro (HH) 168. Near top center in the frame, the Herbig-Haro object emission is generated by energetic jets from a newborn star. Posted on Friday, 28 September 2018 by VGC	This entry was posted in ifttt-photograph and tagged IFTTT, NASA. Bookmark the permalink.